It is a challenge for a new business to get set up and begin to operate. For you to take that step, it takes a lot of work and a fair amount of smarts. Even if you are up and running, there is always the proverbial ‘wrench in the operation’ – decisions to make, problems to solve and bills to pay – the list goes on. And then you worry about making a mistake or worse – the ‘F’ word – failure! According to statistics published by the Small Business Administration (SBA), about half of all employer establishments survive at least five years and a third survive ten years or more. This is a far cry from the previous long-held belief that 50 percent of businesses fail in the first year and 95 percent fail within five years. Initially you will need help with all areas of developing and running your business. There are many ‘moving parts’ to running a business. Today, I want to address just one part: Common Tax Pitfalls. Are you ready for the new fraud-fighting credit cards? The thought of having our credit card information stolen has a lot of us worrying about what’s in our wallets. Credit card issuers and payment processors are even more concerned than we are, since they’re on the hook for a huge share of the tab. And with credit card fraud costs in the U.S. rising to $11 billion in 2013, it’s no surprise they’ve taken bold steps to fight the hackers. Maybe you’ve already heard about the new “smart” credit cards that contain tiny, powerful chips designed to fight fraud. The technology, known as EMV, is named after the three organizations who spearheaded it: Europay, MasterCard and Visa. It’s hard not to freak out when you hear that 104,000 U.S. taxpayers have had their records hacked, making it possible for thieves to file fake tax returns and possibly even steal your refund. But please don’t panic. Here’s some helpful perspective on the recent news reports and how the situation may or may not affect you. After meeting the 2014 deadline for personal income tax returns last month, did you toss your paperwork into a corner and forget it? Yep. I thought so. (Wink.) But before you stash your papers away, consider that a little time invested now can point to simple steps that can help you improve your financial picture over the next year. Use the questions below to determine what adjustments you may want to make for financial health in 2015. It’s officially the 11th hour. Do you know where your 2014 personal income tax return is? Chances are you’ve already given us your information and your return has been filed (way to go!) or will soon be ready for your signature (hurrah!). But if you’re struggling a little this year, don’t worry. Here are some last-minute tips you may find helpful. There’s still time to ask the IRS for an extension if you’re sure you won’t be able to file by April 15. You will need to pay estimated taxes in order to avoid penalties, but an extension gives you extra time to get all your documentation in order. Should you file for an extension on your personal taxes? We’re already less than 30 days away from the April 15 tax deadline. If you’re freaking out, we have a suggestion you may find helpful. If it’s clear you will need more time to complete your 2014 return, you may want to consider asking us to file an automatic extension for you. The IRS has made this easier than ever by making Form 4868 available online. By completing this form, we can request an extension that will allow you to file your 2014 return anytime up to October 15, 2015. As April 15 approaches, here’s a little good news that may make you feel more empowered as a taxpayer. The deadline for securing health insurance as required under the Affordable Care Act – often called Obamacare -- is this Sunday, February 15. Are you and your family covered yet? Most likely, the answer is yes. But if you haven’t figured out your health insurance for this year, it’s definitely time to take action. Check out the good information you’ll find at getcoveredillinois.gov, the official website for our state’s insurance exchange. The site has frequently-asked questions and resources to guide you through the process. Act quickly, though: if you miss Sunday’s deadline, you will be required to pay a fine of $325 or 1% of your income over the tax filing threshold, whichever is greater. Even if you’re already covered, there are things you should know about the new law. Below is a quick summary to read and share with anyone you know who may have questions. Is the business a business or a hobby? The IRS is stepping up efforts to prevent taxpayers from declaring losses on activities that are not run to make a profit. 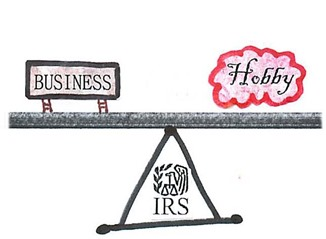 Research shows that incorrect deduction of hobby losses cost the government billions per year. If your business is engaged in for profit, ordinary and necessary expenses are deductible from the income, and a taxable profit or a deductible loss might be created. If your business is not engaged in for profit (hobby), income is taxed in total as other income, and expenses are limited to income received and deductible as miscellaneous itemized deductions if you itemize your deductions. If you own a business, being organized is very important. Channel your income and deductions into a single bank account, monitor it on a regular basis, and use a computer program or filing system to sort deductions into categories. If you own a large vehicle, you will most likely want to save all of your receipts for expenses to deduct actual costs. If your vehicle is smaller and more economical to run, you will want to use the standard mileage rate of 56.5¢ for 2013. In any event, log your business miles on a daily basis. The deduction for the business use of a vehicle can be substantial, and the proof is in the documentation. For 2013 your child can earn up to $6,100 working in your business before any income tax needs to be paid on the earned income. This can be increased to $11,600 if a $5,500 traditional IRA is purchased. While your child earns tax-free income, you save tax dollars by deducting the wages paid. In the 25% tax bracket, for example, you save $2,900 in Federal tax plus $1,774 self-employment tax by paying a wage of $11,600 to your minor child. Be aware that the work the child does must be appropriate for the child's age and must actually be performed to make this a legitimate expense. For example, you could use the technology skills of your computer-savvy children to help in your business. Keep good records, have a signed employment agreement outlining the work performed, and track the payments into your child's bank account. Did you itemize your deductions last year? Check out Schedule A. For 2013, the standard deduction is as follows: married filing joint get $12,200, head of household gets $8,950, and single taxpayers get $6,100. Many more taxpayers are finding it difficult to itemize. If you fall into this situation, you may benefit by "bunching." The "bunching" technique involves itemizing every other year by doubling up on itemized deductions and using the standard deduction in the next year. Defer more income into retirement. Contributing to a 401(k) and/or traditional IRA is a great way to lower your taxable income. Contributions are deducted from your income before taxes. For 2013, you can put up to $17,500 into your 401(k), $5,500 into your IRA (subject to income limitations), and more if you are over 50. You save on taxes now, shelter the money from tax as it grows, and contribute to your retirement wealth. Your present income tax will not be reduced by a Roth contribution, but if you follow the rules, your Roth contribution of up to $5,500 ($6,500 if over 50) and its earnings will be removed from taxation forever. You can start by setting up a filing system for taxes that works for you. It can be as simple as a series of envelopes or folders to hold tax information. Or, if you prefer, a computerized program (QuickBooks) can easily keep track of expenses. What to keep track of varies from person to person, so a look at your last tax return will help you identify the tax matters that pertain to you. Make a folder or set up a computerized account for tax deductions using the tax return as a guide. You'll be amazed at how easy tax preparation will be next year with your own personalized recordkeeping system. While there is still talk about certain taxes about to expire at the end of the year, here is information on what the 'talk' is all about. The tax system, as we know it, is about to expire. On January 1, 2013, unless Congress acts beforehand, taxpayers will be on the hook for an estimated $500 billion in taxes. This tax hike is being coined as Taxmageddon. Who would be affected by Taxmageddon? 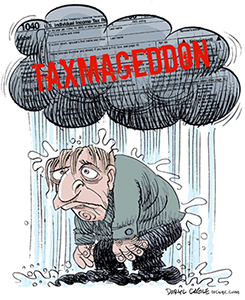 Taxmageddon: What To Expect...and When? What is an Executor's duty? Fresh news to help take the freak out of doing your business or personal taxes.